A short introduction about myself: My name is Nick Roberts and I play in a band called “And the Giraffe” based out of Nashville, TN. A few months ago, after putting out our second album, we decided to shoot a music video to support the single from the record. A friend of mine, Harrison Sanborn, lives and works out of Los Angeles and has been our go-to director/cinematographer for our music videos in the past, so there wasn’t any question that we were going to work with him for this project as well. Given that we’re an independent band, our budgets for just about all creative projects may as well look like we found loose change in our couch. We had about $200-$250 to spend on making a music video when we went out to visit Harrison in LA for a week, and we definitely put it to good use. 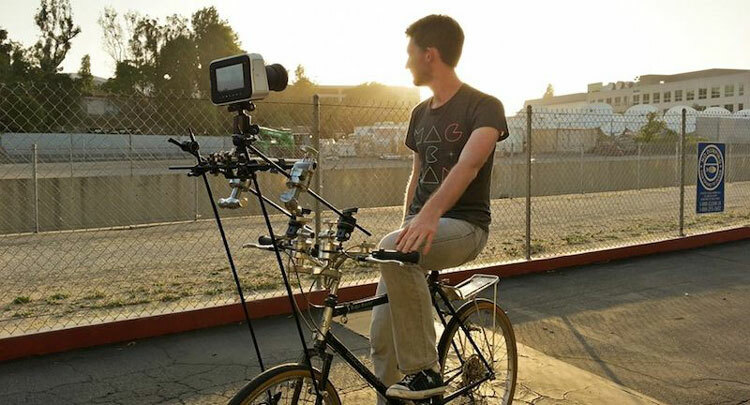 In short, the music video features a camera mounted to the handlebars of a bicycle with the camera pointed towards the riders’ faces, as opposed to looking forward at the sidewalk, as we ride around downtown Los Angeles and into the desert. The idea to do a music video with a bicycle happened almost out of necessity. We had talked about a few different video ideas, but this one really stuck out because of how relatively simple it would be to shoot and how budget-conscious it was. We shot the video with a Black Magic Design cinema camera, a recent purchase by our friend/director. Given the much better image quality of the cinema camera compared to a standard DSLR, there wasn’t much hesitation in our minds as to which camera we should use. The most challenging part of the entire shoot was figuring out a way we could mount the camera to the front of a bicycle without it being too heavy and falling over. We scoured the apartment for a few hours and put together a few different pieces of spare rigging equipment and made some “straps” out of duct tape to keep the camera stabilized. The rigging mounted perfectly to the bike’s frame and the camera ended up sitting about 2 feet from the rider’s face when everything was assembled. It wasn’t the prettiest thing in the world, but it most definitely got the job done. Believe it or not, most of our budget went to completely non-film related things. We rented the bicycle from a bike shop just north of the city as well as a Uhaul van to transport the bike and the rig to and from locations. If memory serves me correctly, the Uhaul van cost us about $150 for 3 days’ worth of driving and the bike was $20 per day (If they knew where we were taking the bicycle and what we were doing to it, I’m sure they would have charged us more). The final shots of the video were done with a Sony F3 as opposed to the Black Magic Design cinema camera, but the footage from both cameras was absolutely perfect for the final product. The few days of filming that we did were long, but the end result couldn’t have made us happier! So I guess what you’re saying is that anyone who might have $200-$250 burning a hole in their pocket can make a music video…as long as they know a director who wants to work for free who already owns a Black Magic Design and a Sony F3 (and presumably some pretty blingy editing gear), not to mention a few hundred bucks worth of Matthews grip equipment to rig the camera to the bike…?!! I feel like there should be a VERY large asterisk next to the title of this post….. I agree, most people shooting a $200 music video will have a DSLR and have to rent the additional camera or use creativity to get around the high dynamic shots. Also, if you look at the other work from Harrison, its truly fantastic, he’s a pro DP. Sorry, but this isnt really same style of project project when you have a pro DP volunteering over 10k (Sony F3 with PL lenses, BMCC with huge amounts of rigging gear, a Gemini external recorder): most of us “indie” filmmakers dream of using that gear on a “$200” shoot. No offense, looks fantastic, just not a $200 shoot.